I spent time with some of the people I respect most in the startup world on this trip, and also with a couple of Rocket folks. I came away impressed as you can see from my latest post, which was written as a guest post for VentureBeat. In Germany, and in many other countries, Rocket Internet is a constant topic of startup conversation, while in the U.S., there is a dearth of knowledge about the incubator. I just finished another trip to Germany, where I am actively investing (seven investments in the past 18 months). Several investments have been made along with Rocket Internet and Global Founders Capital (the fund managed by Oliver Samwer, Marc Samwer, and Fabian Siegel). In the standard U.S. press articles, Rocket Internet is portrayed as a “clone factory.” It’s also known for high attrition rates; in fairness, it does have high attrition in some countries. Some call Rocket Internet “Startup Boot Camp” and say it is the best training for entrepreneurs anywhere; many former Rocket people become founders of new companies. Rocket is ruthlessly focused on aggressive growth and execution, where top performers get tons of responsibility; but it isn’t for everyone, just as many cultures are not. I think of it as similar to the up-or-out approach that many of the top consulting firms have. Rocket is disciplined about shuttering businesses (and even closing down in countries) when they are not successful, which doesn’t help it win popularity contests. Many assume the entire Rocket model is to copy companies with the intention of selling the younger startup back to its U.S. “inspiration,” as it did with some of its Groupon clones. However, the model has evolved rapidly, and the company’s current startups are built to be standalone businesses. Its emulation technique generates some disdain in a community where high value placed on innovation. As an investor, I love innovators and believe the innovators create game-changing and life-changing companies and opportunities. People like Elon Musk are heroes of mine. But when I look at many of the very successful companies like Google or Facebook, many are copies that are simply a lot better than previous attempts. The teams execute better, understand their markets better, and solve a problem better than their predecessors. This generates success here and abroad. Rocket wants to be the best at execution; hence, it innovates on the execution model. Looking beyond the headlines and focusing on the “factory” aspect of “clone factory” yields some pretty stunning statistics. Rocket’s core team of about 1,000 employees builds companies and then spins them out. Rocket employees have the ability to join these companies and even to switch between companies as part of their career path. Rocket has built more than 55 companies, employing tens of thousands, active in over 40 countries. Rocket has raised more $1 billion dollars (not including the operational companies it has spun out). It moves extremely quickly, having launched 14 companies just in Brazil in the past 18 months. Rocket has changed the company-building risk equation in dramatic fashion by creating a large-scale operational company with the ability to invest like a large VC. It essentially takes away capital risk and drastically reduces execution risk, so the main risk left is business model risk. To reduce that, it emulates (in many cases directly copies) models that work elsewhere, especially in the US: Zalora = Zappos, FoodPanda = GrubHub, etc. This is very different from most companies that investors look at today. Typically, capital risk and execution risk are at the top of the list. On the execution side, Rocket is the only company I’ve seen that can launch globally with a large staff and capital overnight. Also, it shares learning and best practices across companies and countries so the execution expertise is grows even faster. In emerging markets, many companies and services we take for granted in the U.S. don’t exist, so the opportunity to copy working models from first-world countries and execute them is immense. Wouldn’t it be nice to launch the next e-commerce company with all of the logistics setup ready to go in multiple geographies, all the financial setup nearly complete, and existing expertise in acquiring customers and even sourcing product? Rocket’s aggressive growth strategy takes market opportunities away from competitors in ways I have not seen elsewhere. One of my good friends, a serial entrepreneur in Europe with multiple successful exits, has a company that is growing 100 percent year over year from a good base and is funded by top U.S. VCs. He can’t get additional funding because Rocket entered his market. I have not seen anyone else globally innovate the venture incubation model the way Rocket has. It is scaling at a whole new level and literally taking markets away from others. At a family party a few weeks ago, I had the chance to introduce Melina to Deszo, and he told her that he would take her and her sister for a ride in the motorcycle (but not fly). Her eyes got big, and there was a combination of excitement and a little fear that I could see. 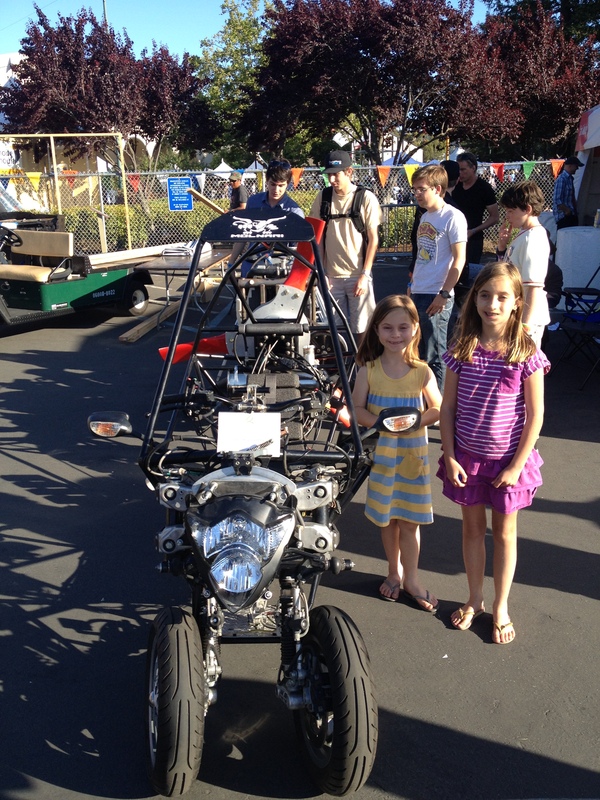 Excitement trumped fear, and we arranged to make it happen at Maker Faire. I was totally excited to expose my daughters to some of the really innovative ideas, companies and people at the Faire. It was everything we expected and more. Some awesome innovation, and more than a few odd inventions and things I’m not sure will really find a market. Melina and Nadia loved the next generation lights– some pretty cool stuff there. They were dumbfounded by the tapigami http://tapigami.com, and I was amazed at the amount of time spent on it– it reminded me of the reaction I have with some of the exhibitions in museums of modern art. There is a combination of respect, wonder, and pure disbelief that this is being done. The robots and some of the creations with legos were just plain off-the-charts. Coming from a background in robotics, I love all the innovation that I see in that arena, and the fact that robotics is really coming into its own, both in the business and the consumer world, makes me very excited about all the opportunities ahead. Both Melina and Nadia have decided that we need a 3-D printer after taking a look at the things that were built by Makerbot, Shapeways, and others. 3-D printing is really one of the game-changers globally– this technology has changed our world forever. We haven’t even begun to see what this does to manufacturing, to innovation, and to global economics. Made in the USA will mean something different going forward. I’ve already decided that my girls need to learn how to use 3-D modeling software– yesterday. At Maker Faire, they both walked away with little souvenirs courtesy of the very generous woman who showed Melina and Nadia the printer and some of the creations. Then onto the highlight of the day. We went to the Molnari booth just as the Faire was closing. After telling the girls a bit about the motorcycle, Deszo put Melina in the back seat and drove her around for a while, drawing attention from everyone. She was grinning ear-to-ear, and totally excited. Nadia was supposed to be next, but one of the Faire officials told us that we couldn’t drive the vehicle until the Faire was completely clear of people, which he thought would be an hour or two. Then he looked at Nadia, and her dejected face, and said he couldn’t keep her from a ride. She got her turn, and I think she was even more excited than her sister. There is nothing like seeing a look of sheer happiness on the faces of your children, and as most parents can attest, it doesn’t happen every day! For me, this was an all-around winner– I exposed Melina and Nadia to some of the coolest technology anywhere, and got to see the looks of wonderment and the huge smiles of pure enjoyment! This is a post that I wrote and VentureBeat published in 2013. The situation is improving outside the US, and in particular places like Germany where much more capital is now available. However, it is still a very different world outside of Silicon Valley. Giving up half of your company for a mere $250K seems an absurd proposition. Only offer on Shark Tank? Bad business school case study? I must have missed a zero or two, right? If that sounds bad, how about half of your company for $90K? Crazy? No. This is the reality in many places outside of Silicon Valley (and especially outside the US). And it isn’t good. I’m going to talk today about Germany, where I commonly see this issue. There are plenty of countries that have similar issues, but since Blumberg Capital is very active in Germany, and I sit on five boards in Germany, I feel most comfortable writing about the specifics that I know. I happen to be writing this today because I’m in Berlin and this issue is front and center for a couple of companies that I’m looking at. If you are an entrepreneur in Berlin, you are hard-pressed to find capital for your company. Even with the notoriety that Germany, and Berlin in particular, has gained, there simply is not much capital available here. Relative to Silicon Valley, the capital available in Germany is a rounding error, and even relative to London, Germany suffers a definite lack of capital. It is slowly changing, but not nearly as quickly as it should. In Germany, entrepreneurs starting out would appear to have similar opportunities to those available in the US — there are some very good incubators, there is an excellent group of angels, most of whom have built and sold companies previously, and there are a couple of very early stage funds. But, the scale is just too small. And at the early stage, the lack of capital is most pronounced. – First rounds in Germany (call them seed rounds) tend to be small (50K – 250K), and nearly always done by angels or small super-angel funds. A 500K round is considered very good for the first round and is quite rare! – Founders give up significant portions of their company to angels just to get a little capital at the outset. It is common to see investors take up to half of a company up front. – Early stage companies are often under-capitalized, which makes it difficult to scale and raise further growth capital. – The funds in Europe that invest more significant capital tend to wait until a company has substantial traction — say, EUR 5M -10M in revenue. All of this adds up to a couple of significant issues that challenge the ecosystem. 1. Capital risk is huge — companies that raise small rounds struggle to hit the milestones for their next round, and many either don’t make it or end up very small. 2. Cap tables are screwed up. It is very common for founders to only have 10% ownership after they have raised Series A or Series B. It leaves far less upside, and we often see angel investors with bigger stakes than founders. Why is this the case, and what can be done about it? At each stage of the company, there are different issues. Very early, when angels typically lead rounds, it isn’t uncommon to see a company raise $100K to $250K and give up half the company, usually with the promise of “shares for support.” The investor promises to help with setup, operational expertise, fundraising, and some key elements of the business. I don’t want to be negative toward the investors who truly do act as cofounders and get companies off the ground, but not all angels fulfill this promise. If they fall short, this approach is really aggressive from the angel perspective and doesn’t leave much room for future rounds in terms of the cap table. To me, unless the angel investor is truly a cofounder and helping day-to-day in operations, these “shares for support” and huge dilution scenarios don’t set the company up for success. At the next round, typically Series A in Germany, which is roughly equivalent to seed rounds in the US, there are not very many players. One of the reasons Blumberg Capital is investing in Germany is because we are finding great opportunities to fill a part of this capital need. In contrast to the US, where there are a fair number of early stage funds, in Germany, there are very few, and there is a substantial gap between angel funding and bigger rounds where traditional European VCs jump in. This void is very real, and many companies never get beyond their initial angel round. At Series B and beyond, what we find is most VCs are looking for significant traction. This means that companies need enough runway and capital to really scale, and if that isn’t there, the companies face serious capital risk. Again, because there is not a lot of capital available, the VCs who provide the larger amounts of capital are very smart to wait for companies to break out before making investments. They don’t need to rush. It isn’t like the company has a ton of options for financing. So, let’s take a real world example. Company A has a group of great founders going after a big market. They are one of the companies that attracts the attention of some strong angel investors. The angel investors convince the team they can really help, and that giving up 50% of their company when it is formed is not bad in exchange for their help. The company gets $250K for 50% at the outset. This company does well and is able to attract more capital. It raises a pretty solid seed round ($500K) from angels and a small seed fund at a $2M pre, taking 20% in dilution. It really starts to hit its stride now and attract a solid Series A of almost $2M at about a $6M pre-money valuation. In the US, this might be their seed round, and the earlier money may have come from bootstrapping or friends and family. They take another 25% dilution. Now the founders have diluted by nearly 50% AFTER they gave up 50% at the outset; they have a total of about 20% ownership and have not even gotten to growth stage capital yet! In the US, this would be almost the opposite, where investors would likely hold about 20-25%, and founders would still own the lion’s share of the equity. The screwed up cap table has very negative impacts on the upside potential and the incentive structures. In general, the lack of capital and the fact that the investors extract so much from the companies act as deterrents to startup growth. We aren’t going to wake up tomorrow and find that significantly more capital is magically available, so what can we do to work with the constraints that exist? Education is the area where founders can most directly impact their opportunities. I find that US founders are generally far more knowledgeable about equity compensation, dilution, fundraising, and scaling businesses, but as ecosystems like Berlin are evolving quickly, the base of very knowledgeable founders is increasing quickly. In Berlin today, and in many other places, experienced founders and investors are willingly contributing their expertise to help others build, and this is a key to making the system function efficiently. As I have watched the ecosystem in Germany grow and mature over the past couple of years, I am seeing progress on all fronts. More investors are paying attention to Germany, so capital levels are slowly increasing. And, as the market continues to evolve, we are seeing that people are more mindful of raising enough capital to be able to scale, and also to ensure that the founders have the equity incentive to build great companies. One final note: I have focused on Germany here because I have the most experience in Germany, but these issues are very similar in many emerging startup ecosystems around the world. I hope that, as we continue to build these ecosystems, we will set them up to maximize the potential opportunities. My latest post on financial services– there will be more on different topics where I see some great opportunities. This was published by VentureBeat. Payment-processing startup Paymill recently raised 10 million euros to drive expansion throughout Europe. As the lead investor from Blumberg Capital, I am positively biased about the opportunity, but the story is bigger than Paymill, Stripe, Braintree, or any of the new generation of payment processing companies. So before giving in to the hype around financial technology startups, it’s worth examining the huge opportunities that lie in fixing broken processes. How can we improve painful processes? Every entrepreneur who has had to go through the process of setting up their payment gateway and/or merchant account knows that it isn’t always simple. When I set mine up, BrainTree, Stripe, and Paymill weren’t around. I was given a chisel and stone tablet and asked to deliver all my information in triplicate. Intermediaries, paperwork, antiquated systems, processes, and regulations still play a prominent role in today’s ecosystem. Companies like Stripe have made things much simpler on the front end, especially for developers, eCommerce, and SaaS businesses. But, much of the world hasn’t moved yet, and behind the scenes, there are typically multiple institutions involved just to accept a credit card transaction. Take the story of Jamie, an entrepreneur whose company charges for digital goods. When he was setting up his site to accept payments, he signed up with a payment gateway (before Stripe or Braintree were around). He filled out all the paperwork. Two weeks later he was rejected because the form was not completed correctly. He redid it. Ten days later he got accepted, but only for the gateway; he still needed the merchant account. He went to his bank where they were happy to help. They gave him a large stack of paperwork to fill out, which he did. A couple of weeks later he got a call to ask a few clarifying questions. Did he have any transactional history? No. Could he explain exactly what he was selling? Sure, but they didn’t seem to get it. What about refunds? He didn’t know because he didn’t have history. They had to make conservative assumptions. Nine days later he got the good news. He had been given a merchant account as a high risk merchant, and his transaction fees would only be 2.5 times the norm, and he would have the opportunity to reduce his rolling reserve over time as he built up positive transaction history. I recall his response to the news vividly, but can’t really repeat it here. And all of that was before he started any technical integration, or trying to get all of this live in a production environment. Thank goodness for BrainTree, Paymill, Square, and others that are tackling this problem. 3. Payment gateway passes data to the acquiring bank (merchant’s bank). Fraud analysis is done, often both by the payment service provider and the acquiring bank, and many use 3rd party providers as well. 4. The acquiring bank sends the transaction to the credit card exchange, which acts as an arbiter and clearing house in the final transaction. 5. The transaction goes to the issuing bank for approval (after fraud analysis is completed), and if it is approved, the approval code is sent back through each group to the customer (steps 6-10). In all, 5-6 players generally touch each transaction, and the round trip is completed in seconds or less to get approval when you swipe your card or enter it online. Companies such as Paymill and Stripe wrap the functions of the payment gateway, fraud analysis and acquiring into one service, but they work with partners to make that happen. In Europe, Credorax has built a single technology platform that integrates the acquiring bank, fraud analysis and gateway, which is simplifying part of the chain. All of these companies are doing great work to simplify payments, but they really represent the visible part of the iceberg. (This is not including companies like Dwolla who are building their own network outside of the traditional rails). Plenty of opportunity remains to simplify and improve the entire value chain. Onboarding merchant accounts, ensuring that new customers meet Know-Your-Customer requirements (and evolving regulatory requirements), understanding true measures of risk, providing appropriate fraud analytics, and making all of this more efficient and customer-friendly remains difficult, especially in the global context. The huge opportunities for this new generation come when today’s technology, data analytics, and design are applied to legacy problems in big markets (credit card processing globally is about $5 trillion). It isn’t an easy path, and although some new companies have skyrocketing growth, their huge opportunities come when they expand beyond just the “face” of payments and get further into the guts. I had the pleasure of joining the @CookTasteEat team on the set this past week and have nothing but gratitude for their warm hospitality! 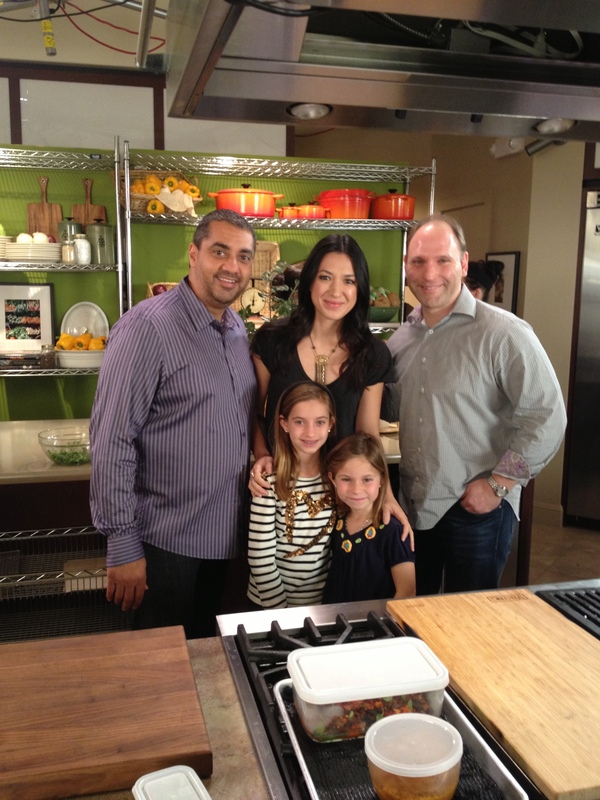 It was an amazing experience, and they were extremely gracious in hosting Melina, Nadia and me. Personally, I’m blown away by the way this team is so focused on producing a top quality product. It pervades everything that they do, from the attention to detail with each recipe, the amazing guests, the high quality production and set, and that doesn’t even begin to speak about the food! It is a huge differentiator for the company and the people, and I am very proud to be part of the team. For Melina and Nadia, this was an amazing experience. I love to expose them to different experiences, and allow them to see some of the myriad opportunities that they will have as they grow up. Both of them loved the opportunity to say “Action!” when it was time to shoot, but the people and the food stole the show for them. I loved all of the different conversations, from Melina explaining that her favorite food was clams, to even guessing that they were going to cook creme brulee, and both of my girls talking way too much about funny family stories. Michelle was so good to the girls, listening to all of their stories! Melina and Nadia had a blast, and they loved the food, and tried everything. Lamb. Caviar. Creme brulee. Strawberry short cake. And salad (which made Dad very happy). They tried everything, and there wasn’t anything on the menu that they didn’t like. And some things I could hardly stop them from eating! I can’t wait for the next time, and I am very excited about all of the opportunities ahead for CookTasteEat. Some great partnerships coming, and with the continued dedication to quality, the sky is the limit for this team!